It’s the time of year that everyone starts to dream of sunnier climates. The weather is cold, generally gloomy, mostly wet, and we all end up day dreaming of the most elusive thing in the UK “ Sunshine”. So you book your holidays, daydream about what you’ll pack and gladly think about the most difficult choice being to sunbathe by the sea or by the pool. But while you’re dreaming of your perfect escape, who’s going to look after the family member who won’t be coming with you? Choosing the right cattery can be a daunting decision, leaving behind a family member in the care of a relative stranger is no easy task. So how do you know which to pick? We’ve put together a small guide for you on what to look out for to make sure that your cat’s holiday is just as amazing as yours. Know your price range – Catteries will range in price depending on their location, and services available. As with all things, generally the more you pay, the better the service provided will be. In the MK area prices will range from £8.50 to £15 per day, with some discounts for multiple cats! Inspections – If the cattery you’re interested in doesn’t allow any prior inspections, then seek somewhere else. Meeting the people who will be looking after your family member while you’re away is really important and shouldn’t be underestimated. Websites – If they have a website then it’s worth looking into all that they offer, and if there are any specific terms and conditions you must abide by before lodging your cat there. Testimonials – On their website is great, but those on a hosting website e.g. yell.com are better as they’re not controlled by the cattery owners and so not subject to bias. This means you can get a real idea of what other cat owners before you have really thought about the cattery. Housing – Your cat shouldn’t be housed with cats from other households, so individual housing should be available. That being said, if you have multiple cats, it would be better for them to be housed together and so family accommodation or cat flaps opening up several individual pens to one another should be available. The housing should also be heated, even in the summer the British nights can get chilly, its important that your loved one stays comfy and cosy so they can enjoy their holiday. Environmental Enrichment – At home your cat will have access to a range of different environments to play around in, a cattery should ideally provide facilities for play and scratching around to ensure that your cat doesn’t get bored during their stay. Outdoor Access – It is important for cats to have the access to the outdoors that they are used to but in a safe environment. Ideally the cattery should have an outdoor run providing a safe area for cat’s to have the outdoor exploration they are used to. Also some catteries may offer outdoor access ad lib, so your cat may come and go as he/she pleases. Safety Passage – Should your cat prove to be a bit of a Houdini, a safety passage should be in place so that if an escape attempt is made, they can be caught and returned to the safety of their pen, quickly and without any problems. The Surrounding Area – If your cat isn’t used to dogs, then ideally the cattery shouldn’t be in range of a doggery, or any noisy neighbours! Vaccinations – A good cattery will require that your cat is fully up to date with their vaccinations before entering the cattery to ensure that there is no spread of disease at all. Flea and Worming treatment – Most good catteries will also ask that your cat is treated for fleas before their stay, and some may also ask for up to date worming treatment. Prescription/special diets – Catteries should either offer most diets themselves or be happy to deal with feeding special prescription diets. Medications – Some catteries will be happy to administer medications, its worth checking if they will do this and if there is any extra cost incurred. Grooming – Long haired cats will need grooming on a regular basis, you will need to check if the cattery will provide this service and if there is any additional cost involved. Veterinary arrangements – These should always be sorted BEFORE you leave for your holidays, you will need to give the cattery your consent for veterinary treatment if it is necessary. Checks should also be made as to which veterinary surgery will be used in the event that your cat does require attention. TLC – Your cat is used to having a loving, caring owner at home and so should be spoilt with love and affection whilst on holiday too! Ensure that there are provisions made for time to be spent fussing your cat. Happy Cattery hunting, and Happy Holidays from all of us at Milton Keynes Veterinary Group. With the news this week that two people have been infected with tuberculosis, almost certainly from their cats it is a worrying time for cat owners. Evidence at present suggests that the risk of transmission to people from their cat is considered very low and in the Milton Keynes area this risk is luckily probably even lower. Tuberculosis is caused by a group of organisms called Mycobacteria. These organisms are generally quite slow-growing and also quite resistant to antibiotics. There are three main species of mycobacterium that we need to concern ourselves with regards to cats and they are Mycobacterium tuberculi, Mycobacterium bovis, and Mycobacterium microti. 90% of human TB is caused by M.tuberculi and some by M.bovis. Infection in people with M.microti is extremely rare. Cats on the other hand are quite resistant to M.tuberculi with M.microti and M.bovis causing most of their infections. TB in cats invariably presents with non-healing, discharging skin sores, rather than respiratory complaints. In the days before pasteurisation it was commonly caught from drinking infected cows milk but now it is invariably caught by being bitten on the front legs and head by small rodents which themselves have TB, so cats that hunt are at much higher risk. We had an unusual case of TB in a cat Milton Keynes a few years ago. She initially presented with a discharging lump below her eye which on analysis was confirmed as TB but was unable to be classified. She had 6 months of triple antibiotic therapy and seemed cured. A year or so later she appeared with inflammation in the left eye which resolved with treatment. A few months later she came back with this lesion in her eye, a similar one in the back of her right eye and a gritty lesion in the lymph node in her back leg from which we were able to culture the T.microti. She also had extensive lung involvement on x-rays. 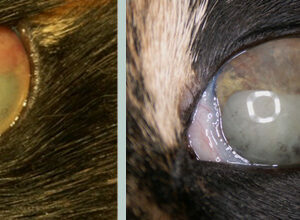 After several more months of treatment the lesions resolved although she remains blind. A year or so later she relapsed with lesions on her spine but she is now on continuous treatment with antibiotics but remains a very sweet happy cat. The problem with TB is that the organisms are extremely difficult to grow and over 50%, in most studies are unable to be cultured. For those of us in Milton Keynes however the good news is that in those cats where we do culture there TB the typing has a strong relation to geography. In a study done between 2004-8 nearly all the cases of M.bovis in cats came from the West of England and Wales, while nearly all the cases from the South East of England were M.microti. TB is difficult to treat in both people and animals and there is also the ethical dilemma of using what are the most effective treatments in people in animals which may lead to greater resistance. 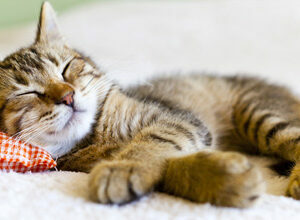 TB in cats is uncommon, but also easy to miss therefore if owners have a pet that is unwell they should consult a vet. However the one ray of sunshine is that cats in our area that do catch TB are likely to be carrying M.microti making the risk to their families very low. As you probably already know a local veterinary practice has had a confirmed case of Alabama Rot, the disease thought to be responsible for the illness in some dogs in the New Forest since December 2012. More recently it has been identified in other counties in the UK, the dog treated locally was primarily exercised in Salcey Forest. The Forestry Commission have been contacted and made aware of the case and are putting signs up warning dog owners immediately. Idiopathic cutaneous and renal glomerular vasculopathy, otherwise known as CRGV or Alabama Rot is a disease that has been known about since the late 1980s. Dogs presenting with the disease have kidney failure and/or skin lesions. The cause of the disease remains unknown. Most commonly, the skin lesions are seen below the knee or elbow, and are a symptom of the disease rather than being a wound from injury. There may be a patch of red skin or an ulcerated area, and there may be swelling around the lesion. In the following two to seven days, the affected dogs have developed sign of kidney failure, which includes vomiting, lethargy and reduced appetite. This disease will not be the only cause of skin lesions or kidney failure, often there will be another cause. 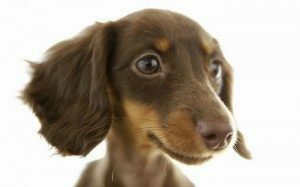 However, prompt diagnosis and treatment is imperative for any dog with Alabama Rot, but without knowing what causes the disease, it is also difficult for us to be able to give you specific advise on prevention or where to walk your dog. We would like to stress that there has been only one case in Northants, but as the disease is fatal in most cases, it is better to be safe then sorry.